Dynamic Programming is a programming technique used to solve large, complex problems that have overlapping sub-problems. 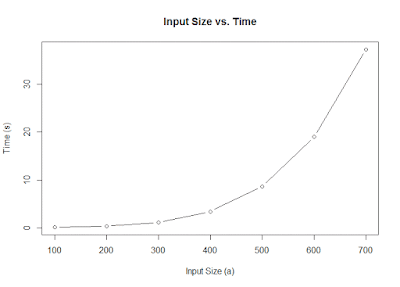 It does this by computing each sub-problem only once, ensuring non-exponential behavior. It differs from memoization (no, that's not a typo) in that instead of computing the result of a function then storing it in a cache, it instead generates a certain result before calculating any other result that relies on it. 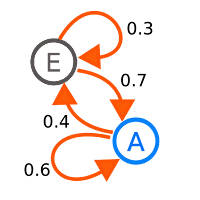 In this blog post, I will give some general background info about Markov Chains, a mathematical structure that arises in Probability theory. I was first introduced to Markov Chains last year and I found them extremely interesting. I found them particularly interesting because they combine ideas from linear algebra, graph theory, and probability theory. Markov chains have applications in many real world situations, including sabermetrics and stock market analysis. The 2 biggest programming paradigms are functional and imperative, but they share very little in common. In this blog post, I will discuss the differences between the two as I understand them and talk about my experience with each. Functional programming languages are very mathematical - functions can be defined piece-wise, recursively, or in terms of other functions. They can also easily be combined forming composition of functions. Imperative languages use a slightly different approach - rather than telling the computer what something is, you must specify how to get it. As a Junior in college, I need to start considering what I want to do after graduation. The two possibilities are to work in the corporate world and do application development or something of that flavor, or go to graduate school and pursue higher education. In this blog post, I will discuss my current understanding of some of the differences between the two, and I will share my knowledge/experience on the best way to prepare for each while in college.